Oh Caroline! What a punt! Now that is quite impressive! After having indulged Diel’s Cuvée Caroline Pinot Noir for Christmas I was really intrigued by the calibre of the bottle. Actually I was really intrigued with the bottle even before we drank it since it has one special detail you notice when you hold it in your hands. One shockingly deep punt (or cul de bouteille in Fench). Of course, the punt serves for the stability of the bottle and is particularly helpful in case of a big depot at the bottom of it, but that size surpasses all engineering reasons and can only have been meant for sheer aesthetics! Sure, it is very easy to hold the bottle that way, you couldnearly fit your entire hand in it, but the risk is big that the consumer will have indelicate thoughts. But on the other hand: wine isn’t meant to be well behaved and decent; always a wild side to it. So I really wonder what the winemaker’s thoughts were.. Is the punt a punt? Also, once the bottle is empty, it still feels full. As heavy as if Rubens had painted it. I love that bottle! Bravo to Caroline! PS: makes me think of one song…. Alex, get your fingers out of Caroline!! I guess the main reason you see deep punts nowadays is that when one makes the bottle larger, it should still only contain 750ml and the difference has to be removed from somewhere..
Plan in a substantial decant, Torsten. Curious to read your opinion about it. I guess your explanation makes sense. 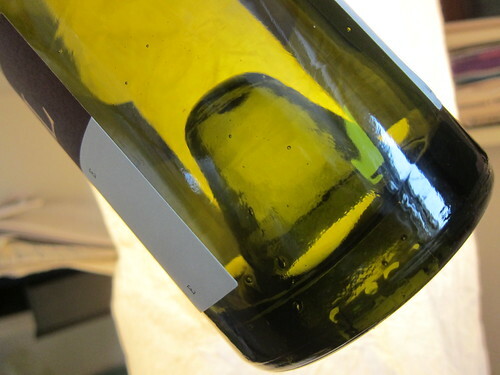 Also, I guess when the bottle glass is thick, the punt has to be thick as well for ensuring stability I assume.